She has also featured on BBC2's Mountain programme and The Holiday Programme. Tyddyn Mawr Farmhouse is an ideal base for walking. Guests can leave their cars at the farmhouse and do circular walks every day of the week! An energetic 5 mile walk around Southern Snowdonia's highest peak (2,927 feet or 892m), taking in Llyn y Cader and Llyn Gafr. A mostly level 6 mile circular walk. The Cregennan Lakes are a gem - a hidden wonder of Wales, yielding stunning views of the Mawddach Estuary and Cader Idris. Such are their beauty that the lakes have been featured in many TV adverts and films. This stunning flat walk or cycle ride along a disused railway track goes from Dolgellau to Barmouth. On the way is the RSPB wildlife centre. Ideal for any age or fitness level. Truly breath-taking. You can always then walk across the wooden railway bridge to Barmouth and experience its stunning sandy beaches, delve into its treasure trove of shops, or relax in one of its many cafés. 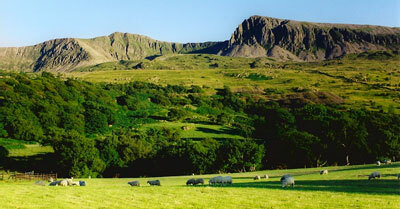 On the outskirts of Dolgellau is a popular 2 1/2 mile walk following a tumbling river in a beautiful ravine. At its best after heavy rain. An easy 4 mile walk near to the Nannau Hall, built in 1693. Passing lake Cynwch, fishing in the lake and then a circular walk around a mountain with stunning views of Cader Idris, Rhobell Fawr and Aran mountains at 2970 feet tall. Overlooking the Mawddach estuary and Coed y Brenin forest. The local peaks are perfect for mountaineering and climbing. Bird Rock is nearby and noted for both climbing and rare seabird watching. It is the furthest inland nesting site for seabirds in the UK. 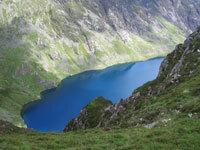 Guided hikes and climbs are available from mountaineer Huw Gilbert of Cader Idris and elsewhere. The Blue Lake, near Fairbourne is a great old quarry to explore, and if you need a guide, try Ross Ashe-Cregan for abseiling, zip-wiring, gorge crossing and caving. Locally, there's the Mawddach Trail Circular Cycle Ride. You can also visit the Coed y Brenin mountain bike centre. Cycle routes for all abilities including the casual once-a-year cyclists up to the serious bikers taking in the famous Karrimor Trail and Red Bull Trail. Bikes can be hired from Dolgellau or Coed y Brenin if needed. If you are the non-cycling partner of a cyclist, relax at Tyddyn Mawr and let Olwen pamper you while your partner conquers the mountain cycle trails! Lake Gregenan - ideal for fishing. Looking down on Cregennan Lakes from Pared y Cefn Hir. Looking down from Cader Idris summit.